What a game to kickoff the 2018 football season where the 2017 Class 6A & Class 7A Champions collide at the Hoover Met. Pinson Valley and Hoover will come together for the first time in school history before a nationally-televised game on ESPN, Saturday, August 25 at 11:00 am. The AHSAA approved instant replay for schools to have it this season but only a small percentage of schools will have it this year. Hoover will not have instant replay for the 2018 season. Pinson Valley coming off an electric 15-0 season last year and 6A State Champions look to repeat at the start the season as our #1 team in 6A in 2018. The Indians have lost a lot of talent off from last season but bring in the nations #1 quarterback in Bo Nix. The Auburn commit had a huge year in 2017 even sitting out four plus games due to an ankle injury. Last season, Nix had probably his biggest game that came against Austin in the playoffs. His line was 31-of-39 passing, 400 yards, 7 touchdowns. No doubt he is going to make a big impact in the 2018 6A playoffs and continue his bright path to Auburn University. Last year, Nix passed for 2,872 yards, 33 touchdowns and just four interceptions on the season. But that was last season and a few of his favorite targets have moved on to college. At wide receiver, Demarion Holloman has the most experience and looks to be the leader of the group. Two way player Ga'Quincy McKinstry will get some action at wide receiver along at cornerback. The rising 10th grader has all the skills to be a good one for the Indians. Seniors Tye Pouncey (Mountain Brook transfer) and basketball standout Geordon Pollard will be in the mix at receiver. On the offensive line, senior guard Jaylen Hatcher looks to bring stability to the Indians line. Senior Earnest Files, a Huffman transfer, looks to help out at tackle. The line hopes to open holes for running back Jay Sharp. The junior running back rushed for 514 yards on 78 carries and three touchdowns along with 203 yards on 18 receptions and four touchdowns last season. On defense, the Indians has some key pieces returning. Rhasaan Christian is one of the key players on defense. Christian holds an offer from Texas-San Antonio and should get more as the season goes. Joel Parker will have the experience to help the front seven for the Indians. Parker holds offers from Alabama A&M, Eastern Kentucky, Garder-Webb, Georgia Southern, Georgia State, Jacksonville State, Kennesaw State, North Alabama, South Alabama, Troy and others. Keyonteze Johnson at cornerback, Gabe Hamby at defensive end and Deshazio Williams at safety look to help out the defense for the Indians. The Hoover Bucs come into the 2018 season with a lot of talent and a few unanswered questions. The first one is going to be quarterback Robbie Ashford. Ashford was injured during baseball season last year and has been working hard to get back into football shape. "Robbie has progressed really good this fall," said Bucs Head coach Josh Niblett. "He has been in a tempo throwing the football. The biggest thing is getting him reps and as many looks as possible. Making sure with his rehab with the plan and the process that he is getting enough film study in so he feels comfortable on what he is seeing and to mark off his toolbox before every play. His arm strength looks very good and can make every throw and looking forward to see him run around on Saturday because he is such a great athlete." The good news for Ashford is a lot of experience is returning on the offensive side of the ball around him. 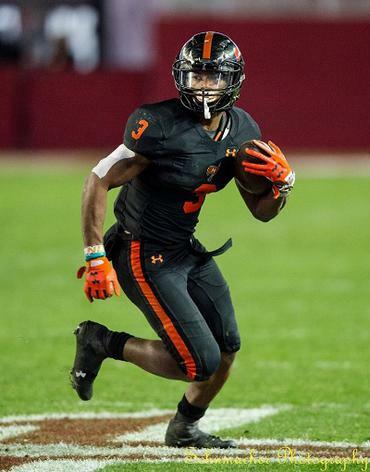 George Pickens is probably the best receiver in the state of Alabama. The Auburn commit can catch it short and turn it into a touchdown or just go deep a make a one-handed catch for a touchdown. He has all the tools to be a great receiver at the next level. With him, Xavier Long, Zach Elam, Omari Brown, Ja'Vone Williams and Jake Tucker will see action at wide receiver and all of them have a lot of speed. At running back, Larry McCammon is one of the most talented runners in the state. McCammon has flown under the radar in the recruiting area and that baffles the Bucs head coach. "Larry is such our X-factor, our guy that can do everything," added Niblett. "He is the guy that has every skill at running back, can run between the tackles with breakaway speed, can run around the perimeter, can pickup blitzes, and then if you want to move him outside and get him in space he is one of our better route runners that has great hands. He is one of our top players, but I think he goes under the radar in recruiting. You talk about a guy that rushed for 1,400 yards in 7A football I don't understand why there is any question about him as a football player." With McCammon running the football will be Kaulin Jackson who is a senior, along with Anthony Hayes and super sophomore Dylan Pauley. Those four guys will be in the rotation and keep everyone fresh. Offensive line David Bodden, Ryan Houston and Garrett Lepkowski lead the way for the Bucs line. Houston is the only returning starter from one-year ago. Houston is developing his leadership roles and has a lot of experience. Bodden at 6-foot-2, 268-pounds will be a first year starter for the Bucs and is an unbelievable competitor. Lepkowski was a part time starter last season. The 6-foot-3 senior at 281-pounds is one of the smartest players on the team and had a great off season in the weight room. The opposing defenses are going to have a hard time doubling Pickens on the outside due to all the Bucs weapons. Throw in the mix tight end Kole Allen who can block and catch the pass and will be a mismatch for opposing linebackers. On the defense side of the ball, look for two linebackers to have monster seasons for the Bucs defense. Greg Russell had 18 sacks last season for the Bucs. "Greg brings a lot of energy to that side of the ball," said Niblett. "He needs to make sure he makes his plays plus more and we put him in places that creat matchup problems. As a team, we need to do a very good job on first down and get off the field on third down. Everyone talks about it but putting people in second and long will give us a good chance in third and medium instead of third and short. We have to do a good job of that on Saturday." Nick Curtis is another linebacker that looks to create havoc for opposing offenses. "Nick has a lot of length to him and is having a good fall," added Niblett. "Very smart football player, recognizes things before they happen. We are excited about him and look for big things from him. Expectations are high just like they are for Greg. He has such speed and length so were looking forward for him to run around making plays. The Bucs defensive line is not going to be as big as in the past but they have great speed. Bryce Carnes will be at nose guard, Joseph Jackson at right end and Samuel Suswam at left end. The secondary is solid with returning starters Jabari Moore at corner and Myles Spurling at safety. Codey Martin at corner and Levi McCree at safety received some some valuable playing time last season. The keys for Hoover according to coach Niblett is to be good on first down. Get some tempo on what we are doing. Get the ball in our playmakers hands. Robbie is going to create a lot of problems for teams. This should be a good one Saturday. I just hope the weather gets with the game plan and players can play through the heat.